Fast: Results are displayed within 3 seconds. Easy measurement: Just press the START Key. Easy calibration: Clean the sensor and press the ZERO Key. Digital Display: No more varied readings caused by user interpretation. Automatic Temperature Compensation: Reliable for any samples, hot or cold. Salt is sprinkled on fried potato slices from a machine, and the amount of salt dispensed is checked and adjusted at the beginning of a production lot. In the past, we had to take samples to the lab for testing, but now we can do it right at the production line. The ES-421 saves us time and money because it does not use reagents like titration systems. Even the disposal of the titrating reagents is not free. 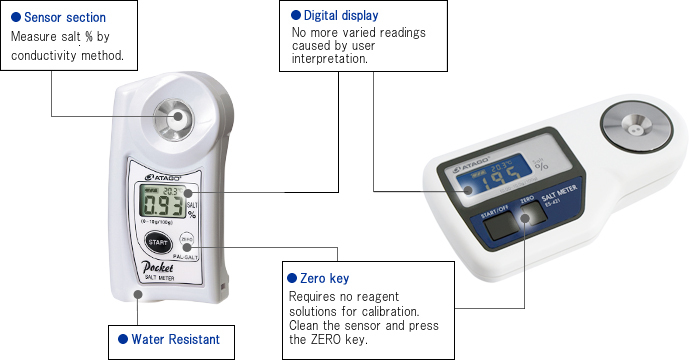 ATAGO's salt meter is environmentally friendly and economical. ES-421.The instrument is perfect for use at the production site because it is compact and does not use harmful chemicals. We are using the PAL-SALT to measure the brine for canned tuna. It is easy to use and completely washable under the faucet. We liked it so much that we purchased a second unit. 1. Apply 2-3 drops onto the sensor section. 2. Press the START key. 3. Measurement value is displayed in 3 seconds.